That's the word we use to describe our friend and Homer, Alaska local, Susan Houlihan, founder and mastermind behind the locally made Alpenglow Skincare products found throughout our facilities at Stillpoint. If you've already visited our boutique resort lodge, you already know... because you've delighted in washing and rewashing your hands with Susan's Arctic Sun liquid gold hand and body wash, you've taken time for yourself in our in our self-spa to sample all of her exquisite, highly-concentrated lotions and sumputous face creams (the rose germanium face cream is our favorite), utilized her Alaska's best insect repellant bug spray out on the trail with our guides, washed body and hair in our warm and luxurious showers with Susan's unforgettable Midnight Sun liquid shampoo... and maybe you even purchased a mini cottonwood balm or bar of local goat milk soap to take home with you. But it's not just the irresistible scents and attractive labels of Alpenglow Skincare that drew us to feature Susan's products at Stillpoint Lodge... we love that they are all natural, locally made, and hypoallergenic for even the most sensitive guest.... and Susan's personal passion for sustainability makes Alpenglow a perfect match for our guest amenities program. 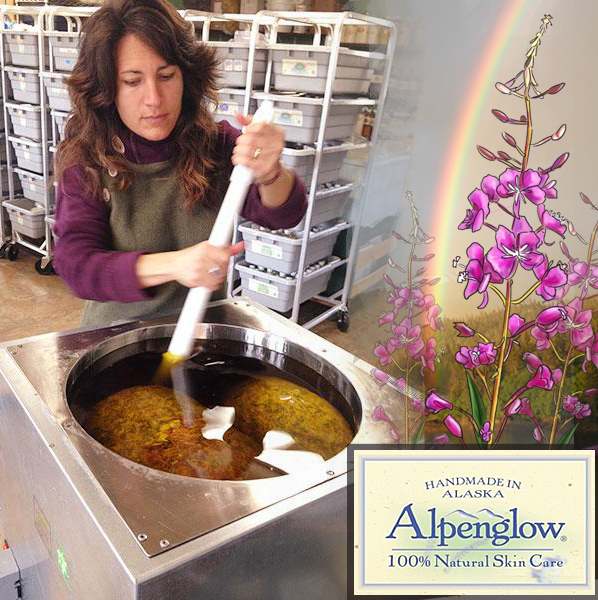 Alpenglow's mission: To create 100% natural, entirely handmade from scratch, superior quality skin and hair care products using organic, wildcrafted and home-grown herbs and flowers. Sign us up! Clearly, we’ve been a fan of Alpenglow for a while, and we continue to expand our support and utilization of their entire product line. Susan is an expert at growing and harvesting beneficial plants such as Alaskan Rose petals, yarrow flowers, horsetail, nettles, fireweed, and cottonwood buds for their scents and therapeutic properties. She's also a lifelong learner in sourcing cutting edge, earth-friendly and safe packaging. We've asked Susan Houlihan of Alpenglow Skincare to be a guest on our blog... so let’s all sit back and learn something from this wise woman. Thank you for sharing your knowledge with us! It's a good idea to be prepared for any vacation, but especially a luxury Alaska vacation filled with daily excursions into nature. Alaska is a state filled with awe-inspiring wilderness and adventure that you'll want to be dressed and prepared for so you won't miss a minute. That being said, you'll want to bring some of the following essential items before you head off to one of America's most extreme, but extremely wonderful, climates. 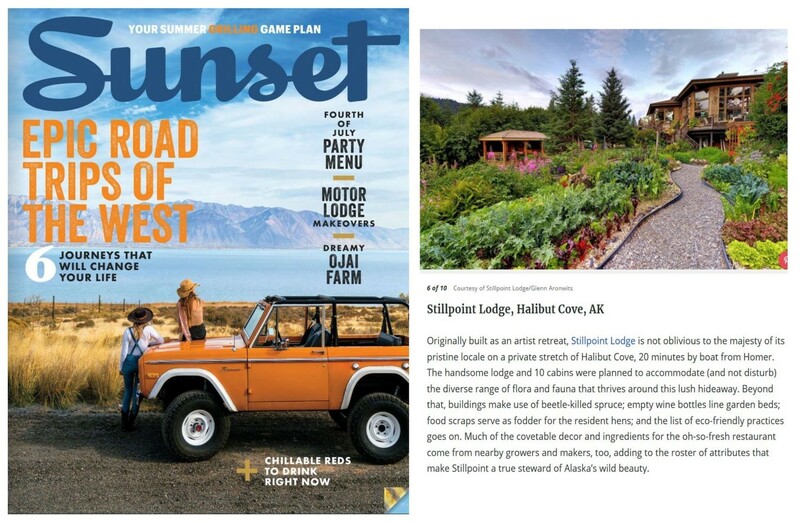 A stay at Stillpoint Lodge is all about nature... the boat trip across the bay, the trees, the ocean, the fishing, moutain scenery, flying through fjords, wildlife encounters by kayak, the garden and the flowers and the food... but we happen to have some pretty amazing facilities, too. The unique beauty and stunning architecture of Stillpoint Lodge can only truly be appreciated in person... to see such a sizeable and detailed structure in this remote, boat-in only location is quite remarkable. But now with new innovative technologies and software rendering capabilities, Glenn Aronwits of GA Panorams of Anchorage, Alaska was able to create an astounding 3D virtual tour. Perhaps it will entice more of our cyber-visitors to come visit in person and experience Stillpoint Lodge for themselves. The 3D scanning and imaging is done with a special infrared camera placed in various locations throughout each building. It creates an accurate, life-like, interactive image that is unlike traditional “virtual walk-through” technology... this is a fully immersive experience. Navigate the whole lodge and all of our cabins in first-person as if you were walking right through each space, seeing it as it is in real life. Zoom out to see the whole scan at once and get a feel for the layout. View the 3D scans from above to get an accurate feel for the dimensions, layout and floorplan.